The laundry room is unquestionably the most purely functional space in the house. 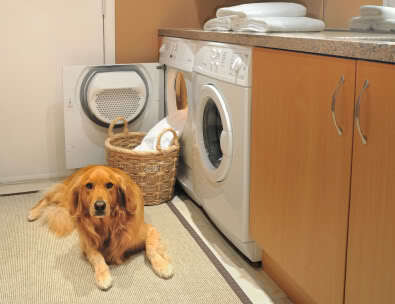 Therefore, laundry room design starts with all the things you need to do in the room. Everything else follows from there — where to locate the room, what to include and how to lay it out. Decide what tasks you want to take care of in your laundry room. Do you want to do just washing and drying there, or also sorting, folding and ironing? What about soaking and drip-drying hand-washables? Might you also want a small work space for sewing, crafting or everyday fix-it jobs? 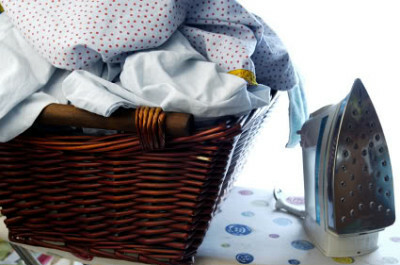 Is your laundry room also going to be your ironing room? It used to be customary to banish the laundry facilities to an unfinished basement or to crowd the high-traffic mudroom space just inside the door to the garage. However, the former is inconvenient and unpleasant, and the latter treats everyone to a tour of the household’s dirty laundry. 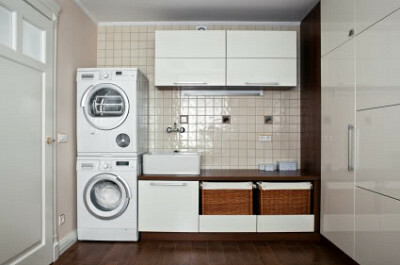 If you have the space, a separate laundry area on the main floor is ideal, especially for multi-function rooms. On the other hand, if space is at a premium or if you prefer a minimal laundry room design, perhaps a hallway closet or an out-of-the-way alcove is the best option. Sometimes, a bathroom closet is a great place to hide a washer and dryer. Front-loading washers aren’t just more energy-efficient and easier on your clothes than standard top-loaders; they also fit nicely under a countertop. For the same reason, many of today’s dryers are designed with front-access controls and lint screens. A simple laminate countertop spanning over the top of both machines is the perfect place for folding clothes right out of the dryer, and this option comes with no loss of floor space. Front-loading washers and dryers fit nicely under a countertop, which is a great place for folding. Laundry rooms are great places to stash all kinds of functional things, from sewing and cleaning supplies to tools and household maintenance items to giant-size refill bottles from the wholesale store. Open shelving is fine for many stored goods, but cabinets are better for anything that must stay clean; lint gets everywhere in a laundry area. Simple melamine-coated or painted cabinets with plain doors offer a clean, uncluttered look and efficient storage space for your laundry room design. A fully equipped laundry room should include a sink. And there’s nothing handier for a house than a deep, tub-style utility sink. Where else can you hand wash clothes, rinse out paint pans and shampoo the dog? Space permitting, it’s nice to keep the “slop sink” at least a few feet from the washer and dryer, so clean laundry isn’t in danger of being splashed upon. An ideal laundry room has plenty of storage and a utility sink. Like a kitchen, a laundry room design can work well with L-shaped, galley and even U-shaped floor plans. “L” layouts fit nicely into a room’s corner and leave plenty of open space for traffic flow or other uses. Galley plans place everything along one wall. If the opposing wall is available, that’s where storage and other task centers can go. “U” rooms take advantage of three walls for accommodating machines, a sink and plenty of countertop areas for folding and other jobs. When it’s time to make everything fit into your laundry room design, again look to the kitchen, as well as the bathroom, for inspiration. Think about your natural workflow for everyday tasks, and plan the space to maximize usable workspaces and storage areas. Also plan for plenty of task lighting for spotting stains and other detail work. Think your laundry room doesn't deserve your attention? Dedicated laundry rooms appeal to potential buyers when it comes time to sell. Talk to a remodeler about the best place to locate your laundry room and how to lay it out. Fill out the form below. Philip Schmidt is a home improvement author and editor based in Colorado. He enjoys honey-do lists and boring his family with random facts about houses.